Come sample the dishes that are emerging from my tasty new pastel palette! Also art from my collections will be available, some at special prices for my friends and collectors, as I make space for new work, as well as reduce inventory for a potential move. . . . no, we haven’t found just the right place yet and are still looking, especially in west Sonoma County. 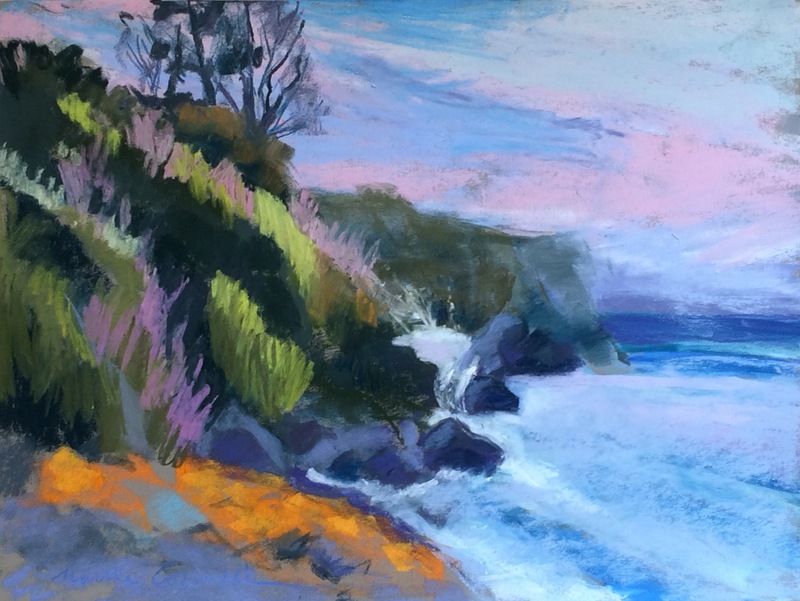 This pastel, “Illumination”, painted last month while I was a “celebrity artist” at the Mendocino Open Paintout, can be seen when you visit my studio. 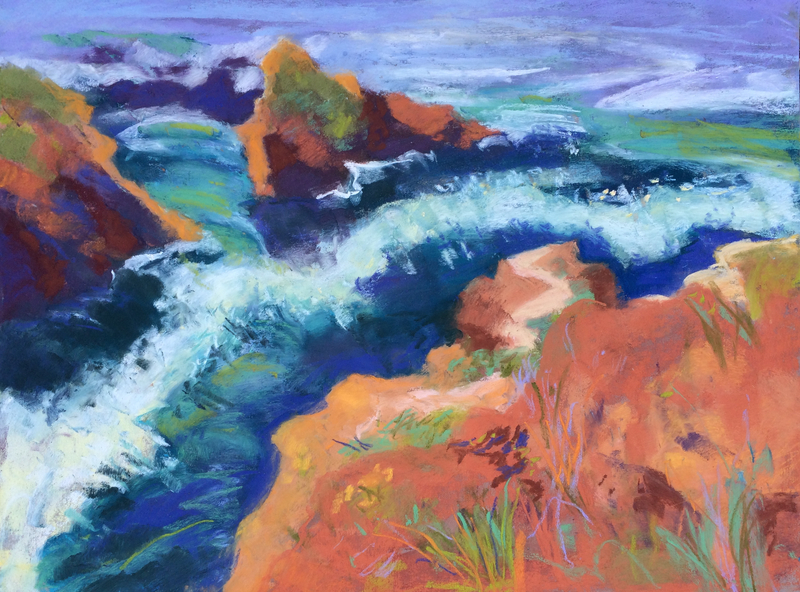 This pastel, “Headlands West, 3”, can be seen when you visit the Art Trails exhibit at Sebastopol Center for the Arts. Notice the warm feelings of perfect summer days on the Pacific coast, compared with the cooler Adirondack oils below. Enjoy a celebration of creativity with the work of over 80 artists! 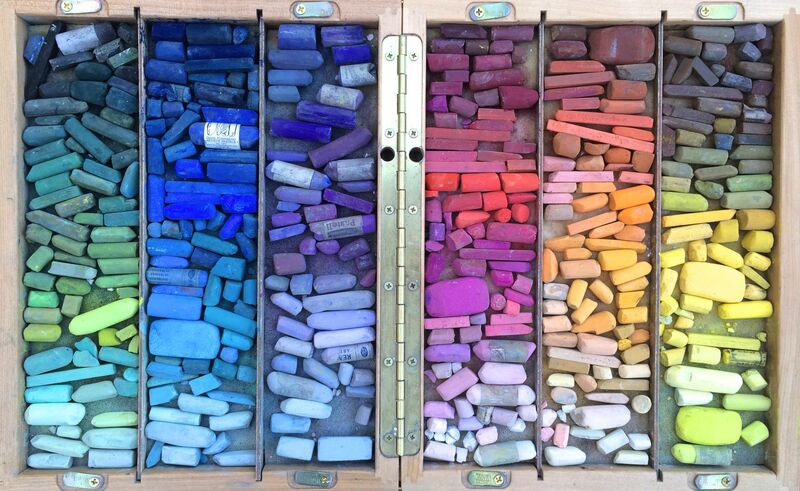 the Art Trails weekends, October 10, 11, 17, 18. 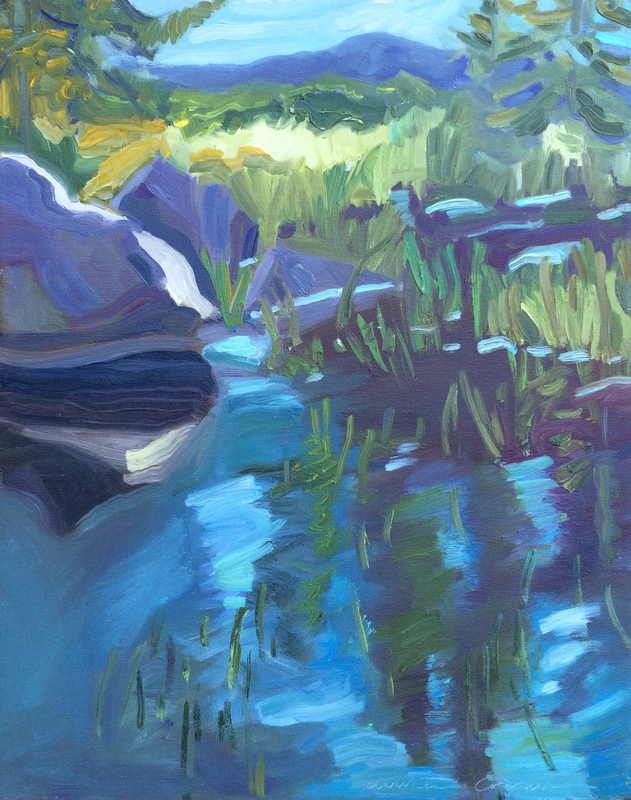 These Adirondack oils, painted this June, sometimes under umbrellas in the rain (imagine that, my drought stricken West Coast friends) at the Publisher’s Invitational Paintout at Paul Smith’s College, can be seen at the Art Trails Gallery at Corricks. Thank you Satri Pencak for the Art Trails photos! 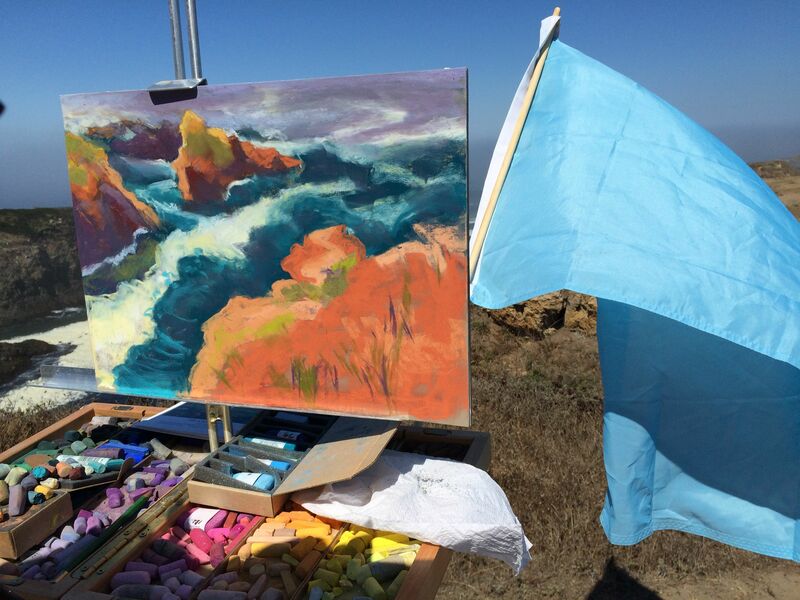 I’m amazed that I just discovered this photo of myself and my catalog painting on Satri’s Sonoma County Arts Blog. Thank you, Satri! 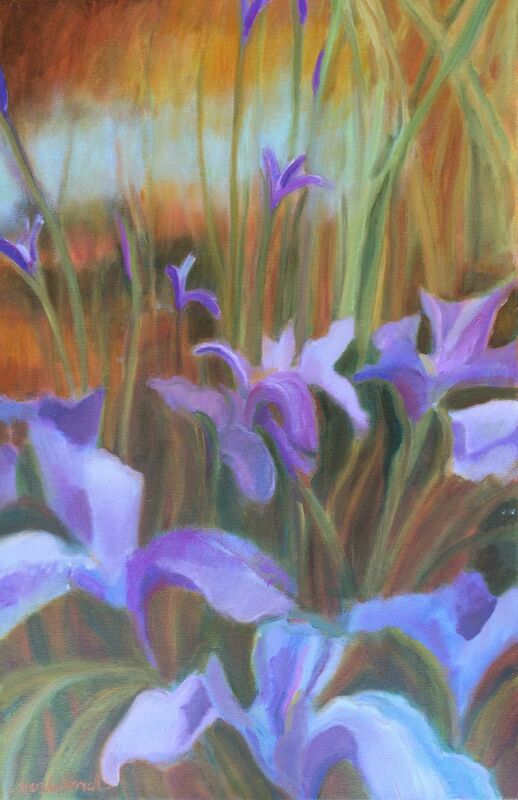 I do appreciate your selecting my artist photo at the coast with sketchbook and my oil painting “Pond and Wild Iris” to represent the wonderful community of Sonoma County Art Trails artists! The October 2014 Open Studio weekends may be over, but look for us again October 10, 11, 17, & 18, 2015, our 30th year! And we invite our friends’ interest and support year round as we continue to exhibit and to teach and to create new work in our studios and en plein air. 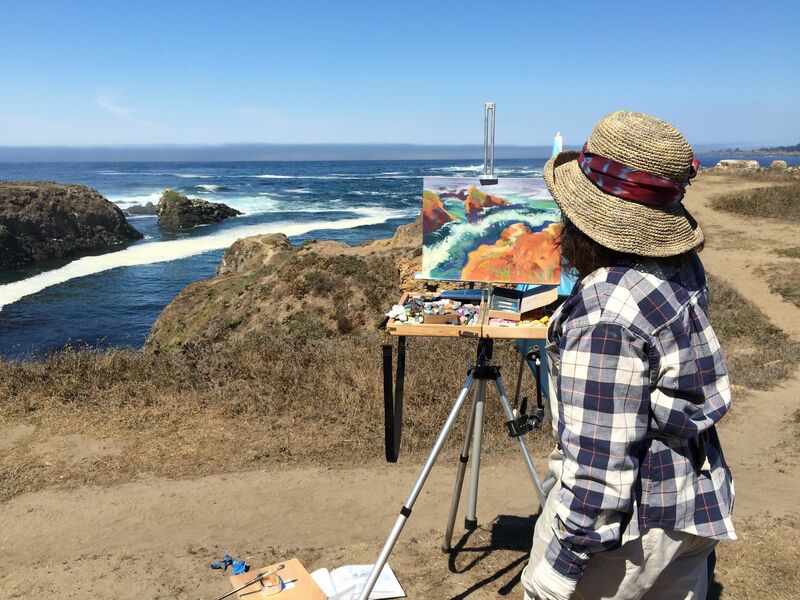 Here’s the very fine article Satri wrote about Art Trails, and links back to her blog pages, where you can also regularly find out about many other Sonoma County art events and profiles on artists. Having been the visual arts coordinator at Sebastopol Center for the Arts for many years, Satri’s circle is wide and knowledgeable. Autumn in Sonoma County means harvest time — grapes, apples, pumpkins, and all sorts of luscious things. It’s also when Art Trails Open Studios is happening over two weekends, Saturday and Sunday, Oct. 11-12 and 18-19, with studios open from 10 a.m. to 5 p.m. In its 29th year, this is the largest open studios event in Sonoma County. Art Trails is a great opportunity to visit artists in their studios, talk with the artists, and see where and how art is created. It’s also an excellent time and place to buy art directly out of the studios for holiday gifts, or to add to your own collection. 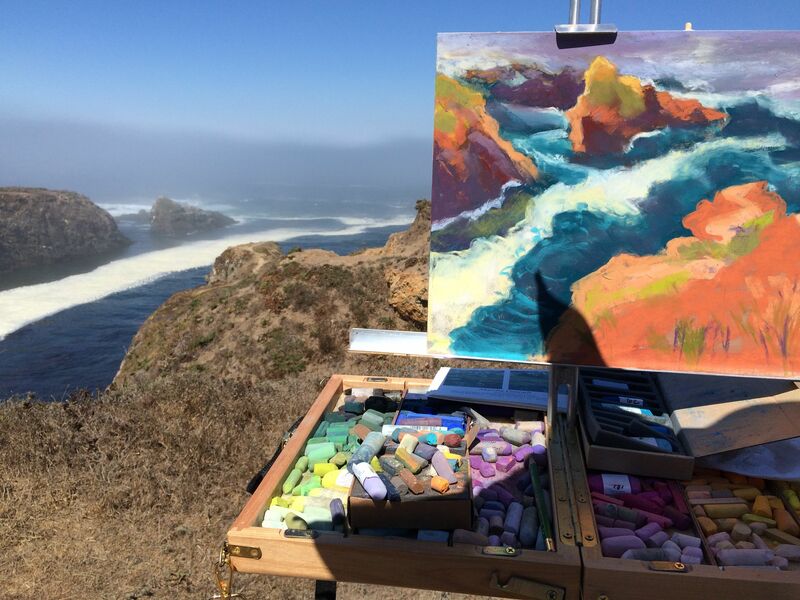 For the first time, Art Trails Open Studios is sponsored by Sebastopol Center for the Arts, and will complement the Art Center’s long-standing annual Art at the Source Open Studios event that takes place in western Sonoma County during June. 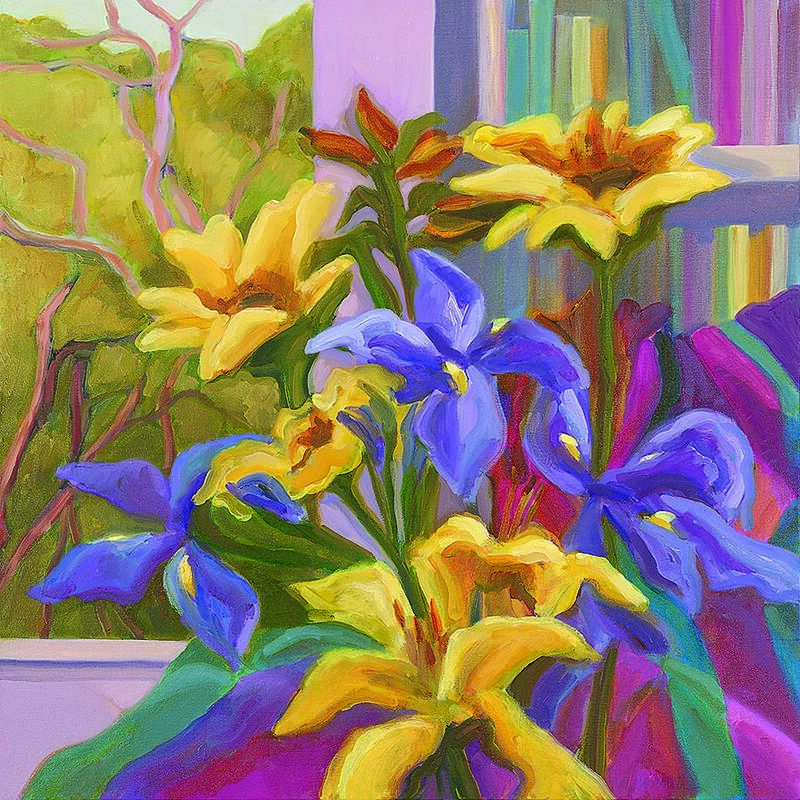 Art Trails Open Studios encompasses the entire county and features the work of 161 artists. A number of the artists are offering free demonstrations throughout the weekends where you can talk with the artists, observe, and learn about traditional and experimental materials and techniques. The best way to begin is to visit the main preview exhibition at Sebastopol Center for the Arts, where a piece from each of the artists is on display. This gives you an opportunity to look carefully and decide which studios you want to visit. You can also visit one of the five satellite preview exhibits presented throughout the county. Then at any of the venues pick up a catalog with maps, schedules, and details, and hit the road, following the blue signs for an easy self-guided tour through beautiful Sonoma County. For more information call Sebastopol Center for the Arts at 707-829-4797, or go to www.sebarts.org, or http://sonomacountyarttrails.org/. Regular gallery hours are Tuesdays through Friday 10am to 4pm, and Saturdays 1-4pm. Extended gallery hours are Saturday and Sunday 10 a.m. to 5 p.m. on the tour weekends. 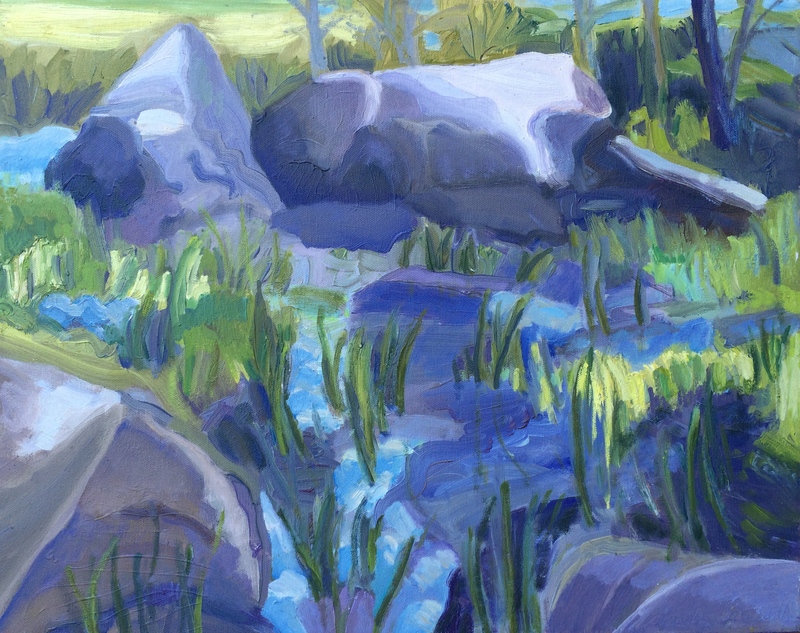 Reception: Wednesday, Oct. 15, 6-8 p.m.
“Iris and Pond”, the painting I’ve featured for my catalog image can be seen now at the Art Trails Gallery at Corrick’s. It will return home for Open Studio weekends, October 11 & 12, 18 & 19. 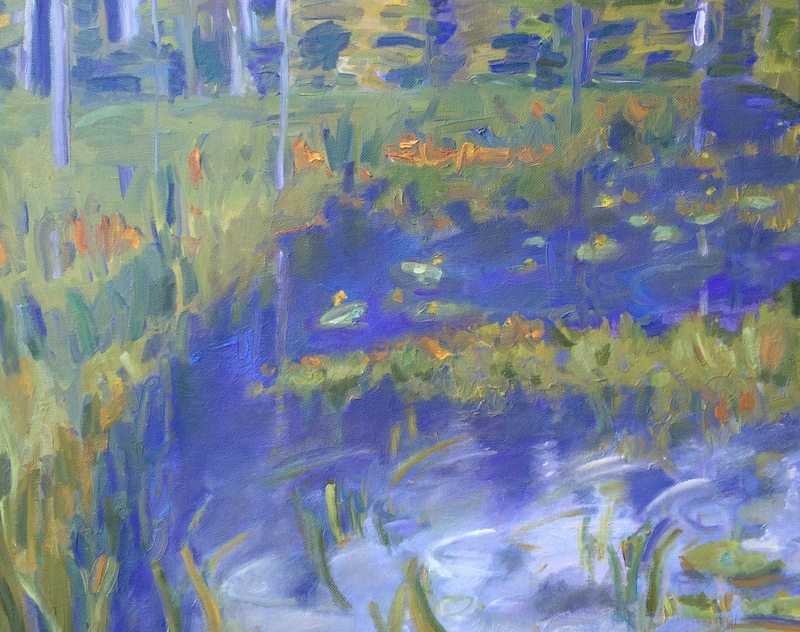 Corrick’s is open M-F 10-5:30 and there will be two Art Trails receptions, First Fridays in September and October, 5-7. Join us! Meet and greet and enjoy the inspiring works in many media by over seventy artists, and of course wine, food, and music, too. Sally Baker and I have been hanging art shows for two intensive days, yesterday the Preview Exhibit at the Art Trails Gallery at Corrick’s and the day before, Art for Life, at Sebastopol Center for the Arts. 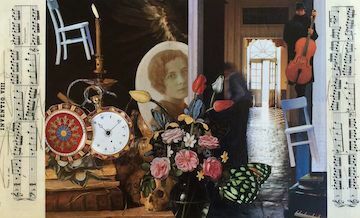 It’s like making three dimensional collages, finding connections and building bridges between disparate objects, so that they have harmonious conversations, but do not blend so much that they lose their individual characters. A visual and physical challenge, and gratifying when it all comes together!